The DESY ATLAS group is heavily involved in the Phase-II Upgrades of the ATLAS Detector. The Phase-II upgrades will enable ATLAS to fully exploited the increased Luminosity of the High-Luminosity LHC, which is planed for 2026. One of the end-caps of the new ITk Strip Detector is going to be assembled at DESY in close collaboration with international partners, especially with the universities of Berlin, Dortmund and Freiburg. Each of the two ITk Strip Detector end-caps consists of six disks with 32 petals each and a total of 40000 readout chips. The petal concept (as well as the closely related stave concept of the Tracker barrel) departs from the classical single module approach which are directly glued onto a local support structure combining mechanical support, cooling and data transfer. The goal of the tracker upgrade is to reduce the amount of dead material while at the same time improve the performance of the tracker despite more severe backgrounds. The DESY group is involved in a wide area of activities ranging from simulation studies, sensor testing, module assembly and testing, the overall system design (both mechanical and electrical) to the readout electronics. DESY is one of the main institutes in the Silicon Strip Tracker upgrade simulation effort and is focusing on dedicated studies to improve the overall performance of the tracker, especially in the end-cap region. The current activities of DESY group involve implementing an accurate description of the end-cap geometry, optimising the number of pixel and strip layers in the upgraded detector, studies involving a potential L1 Track trigger and finally studies involving the b-tagging and vertexing performance. the petals, for the end-cap six different sensor designs are needed. DESY will be one of the sites to produce about 2000 modules - 1500 in Zeuthen and 500 in Hamburg. The team was involved in the actual module design but also in the optimisation of the production procedure. The photo is depicting the first R0 module which was produced in Zeuthen. Besides designing and building the modules, the DESY upgrade team is heavily involved in radiation test studies of silicon sensors as well as materials (adhesives, electronics). 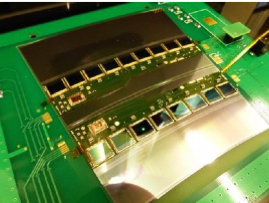 DESY is responsible for the design and production of the interface card between the petal/stave and the off-detector electronics and services. This involves a 10 Gbit/s radiation hard optical fibre link and advanced low-voltage and high-voltage distribution systems like DC-DC converters and High-voltage multiplexing. DESY is working on the mechanical structure (core) of the petals using composites like carbon fibre to minimise the amount of material in the tracker volume. Using detailed FEA simulations, the performance of the petals in terms of rigidity, stability and heat transport is studied in detail. In addition DESY is working on the detailed design of the petal including the insertion tooling needed for the construction phase. Within the Petalet project small prototypes of an end-cap petal were constructed to demonstrate the feasibility of several key aspects like the use of wedged shaped sensors and all their implications. DESY was leading the mechanical effort using advanced material like CFC, graphite foams and titanium piping and is involved in the module building effort. 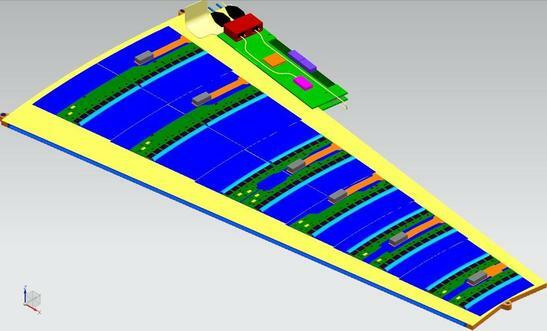 In addition DESY was strongly involved in the design and production of the modules for the petalets. The petalets were assembled at DESY and extensively tested them mechanically and electrically, also making use of our test beam facility on campus. The petalet project was concluded in 2016 and the results were accepted for publication in JINST.